New Sketch integration, audio file embedding, enhanced event capabilities and improvements to Scenarios in this release! This month, Justinmind brings you another fantastic update to your interactive prototyping tool, with an emphasis on the interactive part! Transform your Sketch designs into fully functional prototypes, embed .wav and .mp3 audios in your prototypes, create events for multiple targets in Masters to spread them globally across your wireframes, and tons more. Read on for all of our news! ***See below for the latest update to this release. 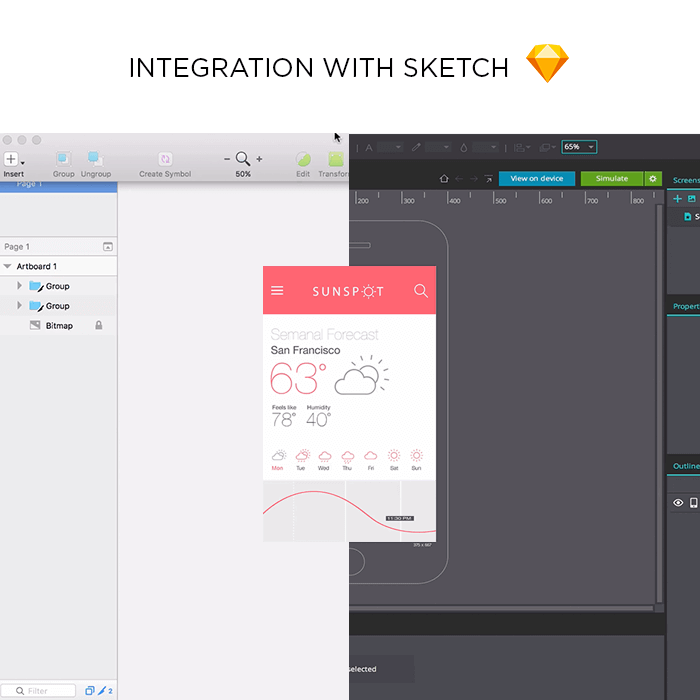 Justinmind brings you a brand new integration with design tool Sketch. You can now export designs you’ve made in Sketch to Justinmind with a nifty new plug-in. Then, you can work on your designs in Justinmind! Export the entire artboard to Justinmind as an image and to create interactive prototypes with drag and drop effects and animations, or export the artboard’s UI elements in individual layers to easily edit styles as well as add functionality. Read this tutorial for all the details on configuring this plug-in and get started with our Sketch integration! Justinmind now lets you embed .wav and .mp3 audio files in your prototypes! This is a great new feature for adding rich, dynamic content to your interactive designs, and will give your prototypes an even more realistic edge. Check it out for yourself here. Until now, you could add events to elements in a screen or within a template with a master as the event target. Now, you can add events to elements in a screen or within a template with any of the items in your masters as the event target. And as we introduced with Templates in our last release, you can now add multi-target events with master items as the event target. This will allow you to easily distribute multi-target events globally in your prototypes! Scenario arrows will remain were placed by the user when working with the zoom and scroll functionalities. A UI screen will be recognized by a screen with the same name in the Scenarios window. With the Creators update of Windows 10, you can now simulate your Justinmind prototypes in Microsoft Edge upon exporting to HTML. Fixed an issue where a valid subscription was not correctly recognized during the last days of the billing cycle. Fixed an issue with Teamwork where events from a screen to a template were getting lost. Fixed a bug where widget events were getting lost upon adding them to a new library. Fixed a bug where some screens weren’t visible in the list view. Fixed a crash that affects editing the user profile when working offline. Fixed a crash when uploading an invalid SVG file in Set Value actions. Fixed a crash with panel selection in Insert Into actions. The “Include top bar” option will active in the Simulation window, until unticked. Fixed an issue with scenarios where bend-points in transitions weren’t automatically adjusting. We fixed the ‘file not found’ error for the Chromium simulation in Justinmind for Windows. We also fixed a crash related to the Events tab in Justinmind for Windows (note that this only relates to the Windows 10 Creators update). In the latest update (May 24th 2017) the crash has also been fixed in relation to touch screen devices. Download our update now and check out all of our new stuff for yourself! Can’t wait to see what you make!